I am in complete agreement with a whole lot of sentiments being thrown around the Internet. We need another Batman or Superman comic just as much as we need another X-Men title – they just keep coming, and there’s going to be a point of over-saturation. So when Batman\Superman #1 dropped into stores, I merely bought it because I felt I should check it out – and I’m glad I did. 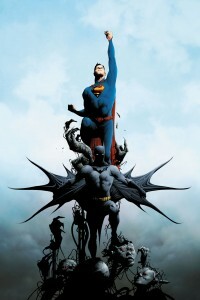 Greg Pak and Jae Lee (with Ben Oliver on art duties for the last few pages) have begun something that while it doesn’t entirely break the mold in the written sense, is still a good story in among some of the most unique and impressive art I have seen in a while. Firmly rooted in New52 continuity, Batman/Superman #1 sets up the first time the two met. While it doesn’t initially address the continuity issue of their apparent first time meeting back in Justice League #1, Pak decides to instead have Clark Kent and Bruce Wayne first meet as Clark investigates the murders of Wayne Enterprise employees. Their initial meeting is great, as it reaffirms each of their own personal philosophies, while also pointing out the flaws as well. It’s not new ground whatsoever, but it does help to highlight that this pairing comes from two very different people. Pak also brings back the signature double narrators that was made popular during the initial run. I’ve always been a huge fan of this form of storytelling – if it’s used correctly. Too often it can appear cluttered and noisy, but Pak doesn’t fall into this trap and manages to control this aspect well. He makes sure each character gets their due, before moving onto the next one. It works really well. The real star of this issue is Lee’s art though. Each panel is absolutely beautiful – a soft watercolour effect mixed with a muted colour palette making the work look stunning. It’s a shame that he doesn’t do the entire issue however, as Ben Oliver steps up for the final few pages. Oliver isn’t bad by any stretch of the imagination and his work manages to hold his own against Lee, but it does feel a bit jarring when we move to a more pencil drawn approach. Just give Oliver his own title to truly show off his work and that’ll make everyone happy. With the introduction of a more magical based villain, drawing on the back-ups of Batman in recent months, Batman/Superman is off to a great start. While it doesn’t appear to be breaking any new ground story-wise – just a standard buddy story for two of DC’s biggest hitters – the choice of artist really makes it stand out. If Pak and Lee can keep this momentum going, those qualms of over-saturation will be soon forgotten.